Shot down and killed in April 1944, Lionel Anderson, a low flying Mosquito intruder pilot, was part way through his second tour of operations. He had survived his first tour stooging up and down the French coast in an outdated Boulton Paul Defiant to confound the German night fighter defenses and allow the Royal Air Force bombers a free run to the target. Lionel's journey to war had been one of enormous excitement, most of which had been spent training in the sunshine and mountains of Arizona, flying during the day and partying hard at the weekends. A prolific letter writer, Lionel continually regaled his parents with tales of cowboys and indians, rattlesnakes and spiders, ground loops and near misses. He also talked of his Hollywood connections, his new ‘pals' Preston Foster and Gene Tierney, and a movie in which he had ‘starred' as an ‘extra'. 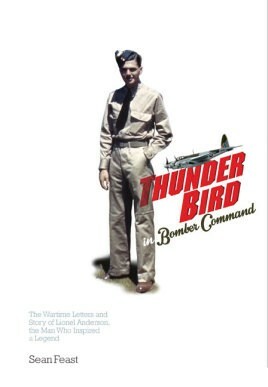 In A Thunder Bird in Bomber Command, acclaimed military aviation historian Sean Feast pieces together Lionel's story revealing a young man dearly loved by his mother and father. He was similarly worshipped by his younger brother, Gerald, who would go on to become a world renowned television producer, director, and writer. It was Lionel's connection with a little-known film that was to inspire Gerry Anderson to create a global phenomena - the legend of Thunderbirds. It rattles along nicely, you get to know Lionel and then a rare operational account smacks you in the face. It is a rare treat.